Yea the general idea I had for mine was someone who saw the Way of Stone as outmoded and pretty much suicide currently, but still felt it had valid ideals, more following her own version it rather than outright rejection, but I'm unsure how much of the racial culture is Way of Stone directly. If it's purely a 'yo stick with old tech' thing that alters things a bit. Random snippet on their physiology probably not worth listing. In one corner of Thayd there is a handful of Mordesh doing studies with a Granok volunteer, who they've asked to put his arm in an open campfire. As time goes on he expresses that he is bored and that 'It kind of tickles.' So, lore-wise anyway, it's implied that Granok are considerably resistant to simple fire. I think Granok are resistant to pain in general. Pappy has confirmed the following. Erm, pardon me, -- I've a question or two if anyone might be able to assist me with it about Granok ages, so if they leave to roughly around 800-900 years. Would it be reasonable to say that a Granok in their early to mid twenties, would be around 200 yrs old? I wonder do they age slower, take a longer time to reach maturity, or do they reach maturity roughly the same amount of years as a human and then their adult life is just longer? I'm planning on making my Granok equivalent of mid twenties, I imagine that she grew up with one of the mercenary groups of the Free Companies. A ship brat who showed an affinity for math, physics and taking things apart, and putting them back together. I figure she was around 200ish, just coming into adulthood when the Mordesh evac happened and she was fascinated by their own high tech sciences. This is just a quick idea rattling around in my head. Make sure I'm heading in the right direction. I understand that they mature fairly quicky so it's possible they would be ready for battle at around 100 years of age. which is what I'm going with for mine. That makes sense, and makes things a bit easier I think for me. I'll probably adjust it just a little, as I do want her to rather young and impressionable when she comes across the Mordesh. Or perhaps she was just fascinated. I'll figure it out. But I'll go with them reaching maturity at around 100ish. Thanks! So from what I always understood, The Granoks we play were exiled from Gnox for using the weapons of the dommies, thus breaking the way of Stone. 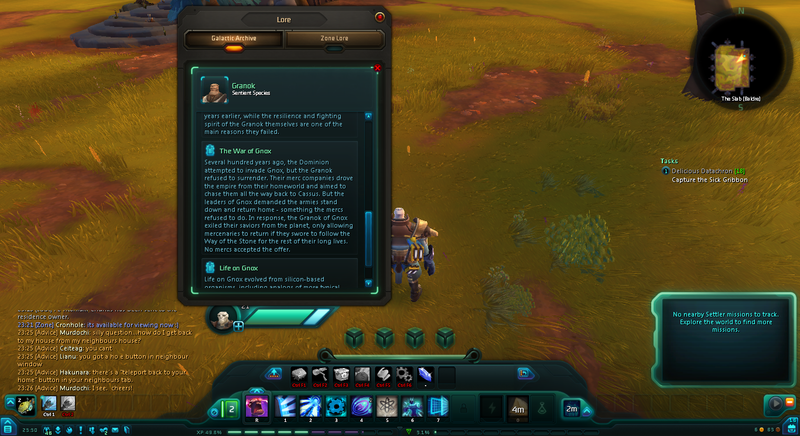 But then I stumbled upon this little bit of ingame lore. So what happened here? they retconed the story or am I missing something? It could be a combination of the two? The mercenaries used the Dominion weapons against them, which went against The Way of Stone. I suppose it's possible that they were offered a way back, but it pretty much included them apologizing for what they did and promise never to do it again, which they didn't want to. At least that's how I could have seen it happen.